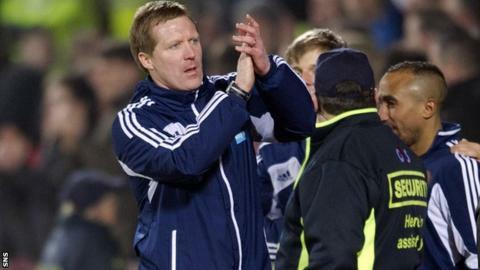 Interim boss Gary Locke said he would be delighted to lead Hearts into Sunday's Edinburgh derby after beating St Johnstone at Tynecastle. Locke dedicated Tuesday's win to former boss John McGlynn, who left the club by mutual consent on Thursday. "If a new manager comes in, then great," Locke told BBC Scotland. "If a manager doesn't come in, and they ask me to take the derby game, then great as well - I'll look forward to it. "I'm just taking one game at a time." And he added: "That victory was for John McGlynn as well because he's played his part. "I was just delighted that we managed to put in that type of performance, and to get a couple of goals as well was really pleasing." "It's a magnificent football club with an unbelievable tradition and history. Whoever takes the helm, they'll be taking over at a huge club." Former Dundee United manager Peter Houston, speaking on BBC Radio Scotland's Sportsound programme on Tuesday, said Hearts have not yet spoken to him about the vacancy. And along with Houston, other names such as John Robertson and Derek McInnes have been mentioned as those who may be in the running. Locke's chances will not have been harmed by the display against St Johnstone, where his front two of Michael Ngoo and John Sutton caused the visitors problems all night. Hearts went ahead through Ryan Stevenson's first-half goal before Sutton added a late second. "When you play with two strikers, the more they play together, the more they know the runs each other's going to make," Locke said. "The whole team, to a man, all played their part. "Right from the start we looked up for the game and that's the kind of performance I said to the players we would need all the time. "If we play like that between now and the end of the season I'm pretty sure we'll pick up points." Meanwhile, Hearts will take "the strongest action possible" after reports in the media suggested the club's staff were told at a meeting on Tuesday that the club could go into administration. "Heart of Midlothian FC vehemently refutes media claims that its staff were told at a meeting today that the club could go into administration," said the statement on Hearts' website. "The report on the Scottish Television website lacks any sort of foundation and is misleading in the extreme. "The club can categorically state there was no such meeting and no such message imparted to staff. "Such erroneous stories cause distress not only to our staff but their families and the club will be taking the strongest action possible against the responsible parties." A Hearts spokesperson said: "We are sickened and disgusted by such unsubstantiated content. "Articles such as this which have no factual basis, show a complete ignorance of the facts and reflect very badly on the profession of journalism. "It is a straight-forward shameless act to destabilise the club and we will consider applying for legal advice to seek justice and damages for the business."